A necklace made of blue tubing with two knots. Long enough to slip over a head. Chew Stixx pencil toppers. One smooth and One bumpy. Orange Flavored. Chew Stixx Pencil Toppers, One smooth and One bumpy. Grape flavored. Tactile Tiger Arm Band Blue. With raised tiger imprint for texture. Tactile Tiger Arm Band Green. Tactile Tiger Arm Bands Orange. Tactile Tiger Arm Band Red. Tactile Tiger Arm Band Yellow. Jewelry You Can Chew These necklaces and bracelets are non-toxic, colorful, plastic and they stretch. Comes in a set of 1 necklace and 1 bracelet. Designed for individuals who exert more jaw pressure, the Textured Grabber XT® is an Xtra Tough version of ARK's Textured Grabber®. It is constructed of a firmer material, but remains chewy and resilient. Chew Stixx Pencil Toppers. One smooth and one bumpy. Chocolate Flavored. Chew Stixx Pencil Toppers , One smooth and One bumpy. Not Flavored. Good for adults and adolescents. Chewy Tubes® are an innovative oral motor device designed to provide a resilient, non-food, chewable surface for practicing biting and chewing skills. Made in the USA. The Super Chew is a delightful oral motor tool designed to provide positive oral stimulation for practicing biting and chewing skills. 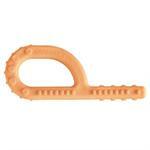 The Super Chew features a closed loop handle which is easily grasped by little fingers. 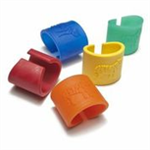 Chewy Tubes® are an innovative oral motor device designed to provide a resilient, non-food, chewable surface for practicing biting and chewing skills. Intended for individual use, Chewy Tubes® are non-toxic, latex free and lead free. Additional tactile stimulation is provided by the surface texture of this Green Chewy Tube. Chewy Tubes® are an innovative oral motor device designed to provide a resilient, non-food, chewable surface for practicing biting and chewing skills. Clear refrigerator tubing for use as chew necklaces. Thirty-nine inches long, 1/4 inch diameter. The four varieties of tubing are ideal for chew necklaces, sucking and blowing activities, or exercising. Four different resistances available. The four varieties of tubing are ideal for chew necklaces, sucking and blowing activities, or exercising. The four different colors represent the four resistances available. It’s designed with ridges, bumps, and swirls on each end to simulate various textures of food used for chewing. Jaw movement and pressure can be experienced through the varied sizes of the ends, which are also small enough to prevent gagging.